We spent this past weekend just outside of Boston hanging out with some good friends. Our time was filled with playing at the beach, a few weekend projects and cooking out in their backyard. We had planned to finish off our Saturday night BBQ with some s’mores but the bugs got to us before our cravings for dessert even had a chance to kick in. The next day, the yummy ingredients—classic graham crackers, bars of dark chocolate and fluffy marshmallows—seemed to be taunting us. No one wanted to fire up the grill or build a fire so I decided to get a little creative with the toaster oven. First I covered the tray with some foil, then I stacked up the ingredients: a base layer of graham cracker, topped with a square of dark chocolate and one marshmallow. I then put everything in a toaster oven set to the highest temperature and waited. And waited. And waited. After about 5 minutes the marshmallows were perfectly browned and the chocolate had started to melt. Each one got topped off with another piece of graham cracker and they were quickly eaten up. Sure, it’s a bit different from the campfire experience and you do miss out on some of the toasty flavor, but this is a great substitute in a pinch. We’ll definitely be doing this again on a rainy day! SWWU Tip: Take this classic treat to the next level by sprinkling a bit of sea salt on top of the chocolate before topping with the marshmallow. 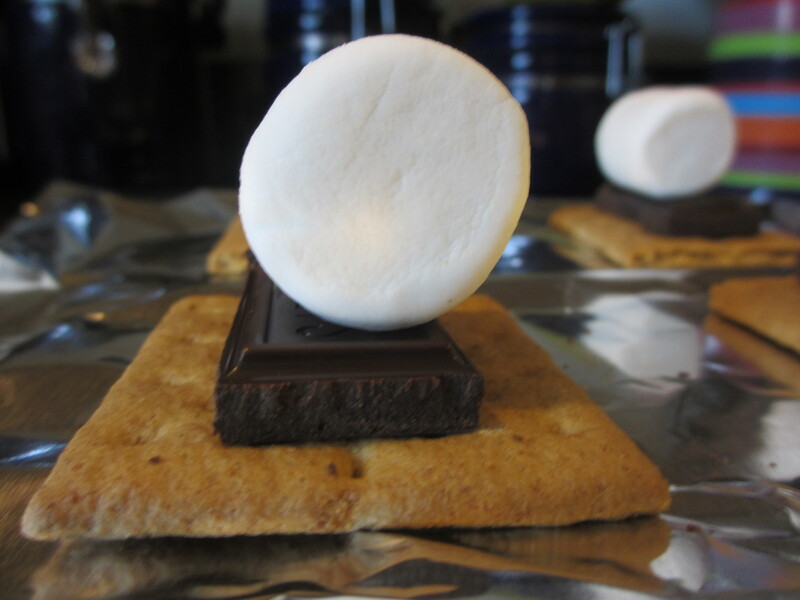 This entry was posted in In the Kitchen and tagged @SWWUblog, dark chocolate, dessert, graham crackers, in the kitchen, indoor s'mores, marshmallow, quick dessert, rainy day dessert, s'mores, sea salt, toaster oven s'mores by Something We Whipped Up. Bookmark the permalink.